Who says home and office storage solutions have to be dull? 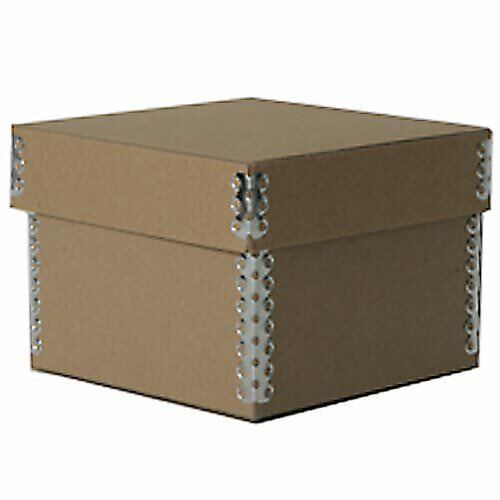 Get a little edgy with our Recycled Brown Kraft Boxes with Metal Edge. These rockin’ little boxes feature a laid-back brown kraft finish and a bold metal trim that will look great on any desk, nightstand, or kitchen counter. Perfect for storing office supplies, accessories, and small homewares, this handy container can be kept anywhere in the house or office. It is small and stylish enough to use as a party favor or company gift promotion and even works as a personal gift box for any type of occasion. Plus, since it is so sturdy and versatile, it is a gift in itself. In addition to a durable brown kraft construction, this box is made with a reinforced metal edge for added stability, so you can trust it to hold even your heaviest items. And since it’s made with recycled materials, this is a box you can be proud to own. Recycled Brown Craft Boxes are 4 1/4 x 4 1/4 x 3. Larger and smaller nesting boxes are also available in 3 1/4 x 3 1/4 x 2 3/4 & 5 3/8 x 5 3/8 x 3 1/2. Also available in Black Plastic, Black Kraft, and Clear Frost Plastic. Made in the USA. Size may be customized if ordering over 100 pieces.